All results from 1997 and ahead. Hakan in action, join him for a ride in the car. A brief presentation of members in the team. Reigning FIA Top Fuel Champ Håkan Nilsson has now abdicated from the throne after a year of retirement from the dragracing scene. We are very happy for our good friend Urs Erbacher who won the championship this year, we was in a battle with him last year and we won with a close marginal over him so it wasn’t more then right that he took the win in this years very close points standing. Sadly our old team mates over in the Andersen Racing / Lucas Oil / Carter Motorsports didn’t have the last bit to get the win this year but we are sure they will comeback in full strange next year and contend for another championship win. We also have to congratulate the FIA Pro Mod Champ Michael Gullquist for a nice job done during the rain shortened season, its well worth Micke to succeed with his different and home built engine combination. Around the Nilssonmotorsports team there isn’t much going on right now, it feels like it must be a pretty good deal coming up if there will be any more championship hunting on the dragracing circus. The team of Håkan, Ulf and Conny made a visit at the ADRL Dragstock IV to check out what was going on over in the states, we meet up with a lot of old friends and had a good time hanging around the track and even learnt a few things about Outlaw Pro Mod Racing. If and when there comes up news around the team we will get them up on this website! There are still a few good old video clips and a lot of photos from the years so please check it out!! FIA Top Fuel Champ Håkan Nilsson Dragracing Driver of the Year 2006. Veidec / Landmeco Top Fuel driver Håkan Nilsson is continuing his success, Håkan is for the second time in his career voted as the dragracing driver of the year by the famous car magazine Bilsport. First time was 2004 when Håkan won his fifth Pro Mod championship and now this time coming out fresh with the FIA Top Fuel Championship. 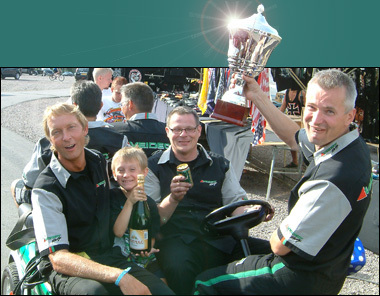 Håkan is the dragracing candidate to win the Bilsport Senior Award 2006, there are three more candidates from three other motorsports classes that Håkan is battling with. There is voting going on thru www.bilsport.se which is a Swedish site and you are also able to leave your votes during the first days on “Bilsportmässan” which is held at Stockholmsmässan 24-26 november. Look at a clip from from mantorp by swedish television. First video showing the Top Fuel!